Just 20 minutes from Waikiki and Honolulu, this private estate is part of a very small class of Oahu homes that sits at the top of Hawaii Kai Cliffs. This 3 story, 5,700 square foot home has phenomenal panoramic views of the Pacific Ocean. While lounging on one of the 3 lanais or inside the pool or Jacuzzi, many of our guests have witnessed sea turtles, dolphins and whales pass by. Some guests have even remarked that the experience is similar to that of being on a boat. The sunset views from the master bedroom provide a magical Hawaiian experience that you will never forget. As a matter of fact, most bedrooms have ocean views and three even have direct access to our outdoor lanais. This home is comprised of 3 bedrooms, each with their own private bathrooms. The master retreat has its own private office and sitting area with pull out bed for young ones that want to stay close to their parents. The additional 2 bedrooms are located on the bottom level of the home with direct access to the pool and Jacuzzi. Everyone can come together on the 2nd level where the kitchen and dining room are located. The kitchen views are so breathtaking that you might find yourself too distracted to actually cook! Koko Head is the perfect place to visit for those who have an adventurous nature. Koko Crater Trail is a famous hiking trail located just minutes away. With an elevation of over 1000ft., it is said to be one of the most challenging hikes on the whole island. Hanauma Bay, which is also conveniently located minutes away, provides the best snorkeling on Oahu. We provide both a telephone and fax line. Our combination of high-end pillows and mattresses are dressed with luxurious 600-thread-count Egyptian cotton sheets in every room. This ensures that all of our guests get the restful sleep they deserve regardless of which room they sleep in. We provide fragrance free detergent and laundry softener for all of our guests. The washer and dryer are conveniently located on the third floor next to the guest bedrooms.. Laundry baskets and hangers are provided in each room. We provide wireless high speed internet that even reaches out to our lanais. Our stainless steel top notch appliances make cooking a meal at home easy. This includes a dishwasher, large refrigerator & freezer, microwave, deluxe coffee pot, tea kettle, oven and all the essential spices. Our kitchen is fully stocked with utensils, dining sets, a state of the art knife set, and immaculate pots & pans. We also provide gourmet coffee, creamer, tea and sugar to enjoy at any time of the day. (4) All of our bedrooms have high definition flat screen tv's with HBO, Showtime, or other premium channels. We even have a TV in the kitchen! We have DVR capabilities so you can record your favorite shows and watch them whenever you want. 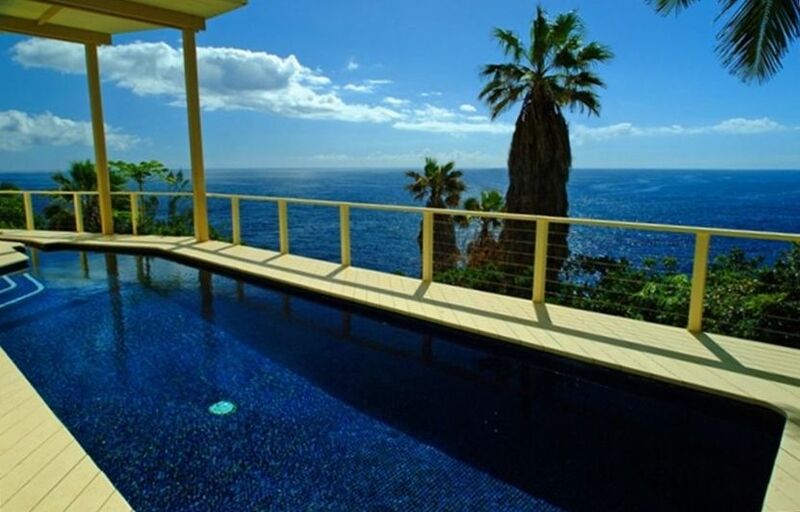 Our pool is located on the bottom level and boosts some of the most amazing views of the house. Take the peacock away and amazing! The house is amazing!!!! BEAUTIFUL VIEWS!!! It is a beach house which is a little older so it does need a little work but nothing to cause you not to rent this house. However, the peacocks that are within 10 feet of house that makes noise all night hurts this house. I brought ear plugs which helped some but the windows are always open in the living room etc. (you can not shut them unless you have a ladder) so it seems like they are in the house, the bottom right bedroom was the worse for the birds. They normally started everynight around 4 am. Also was not aware there is an apartment above the garage. Never heard anything from them nor saw them. Just think it should be disclosed. Dina was wonderful, every problem we had was addressed within hours. The elevator works sometimes. The door is not straight so someone must push on the outer door for the elevator to move sometimes. I am saying everything that was wrong with this house so that you can understand that when I say I would love to go back and stay here again you can understand just how wonderful the views are. Just don't put anyone in the bottom right bedroom due to the birds. The pictures are nothing like seeing the views with your own eyes. It is a wonderful place. Always felt safe and would rent this house again with not problems. right outside of your bedroom windows. I don't know how we will ever have a vacation that will top this one, but if (when) we return to Hawaii, we will definitely be return visitors to Koko Head! This property is NOT what it appears to be in the photographs. There are SERIOUS issues with maintenance and overall property condition. We rented this home for a week and there were numerous problems with air conditioning, elevator not working, toilets overflowing, pool and spa pumps were not functioning properly and the general condition of this "luxury rental" was poor. BE ADVISED THERE IS A BIRD SANCTUARY NEXT DOOR WITH ROOSTER THAT CROW INCESSANTLY AND DON'T CLOSE THE GATE IF THE POWER GOES OUT YOU ARE TRAPPED. The Koko Head house is located in one of the most breathtaking views of Diamond, sunsets, sea life (we saw whales & sea turtles on a daily basis). Waking up to the sunrise each morning is something we are not able to do where we live. The house offered a lot of "little extra" amenities (thanks for having the elevator fixed for my mother in law to use) - coffee & filters; a great welcome basket; baggies; etc. which I did not need to buy. My suggestion would be to add a door to the Master bathroom as it is used also by the person in the 4th bedroom. Also, just let people know it is next store to a person who loves birds (peacocks; roosters, other birds) as that background noise is not for everyone. We are very close to Waikiki and Downtown Honolulu. Waimea Bay is about 5 minutes away and is home to some of the best snorkeling on Oahu! Reservations cancelled 180 day or more from the arrival date are fully refundable, 179-30 days is 50% refundable and anything less than 30 days from the arrival date is non-refundable.